Rhoda Canter graduated from Wellesley College with a Bachelor of Arts in English and then earned a Master of Science in Accounting from Georgetown University. She became a Certified Public Accountant and a partner in management consulting practices at firms including Ernst & Young and Grant Thornton. Now out of the consulting world, she has returned to her first love--writing books. 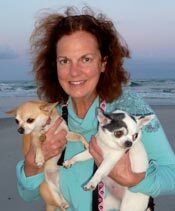 Rhoda is pictured here on East Beach, Bald Head Island, holding her two very real Chihuahua grand-dogs: Bennett, aka Chief Inspector Brown, and Lola, aka Sergeant Starfoot. Rhoda lives in the greater Washington, DC area when she is not on the island. She is married to Mac Canter, attorney and author of The Indictment and The Weldon File. The Canters have two daughters, Mary, owner of the Chihuahuas, and Eleanor.